The VRLA battery is the most popular reserve power design because the electrolyte is captive, preventing it from spilling even when the case is punctured. 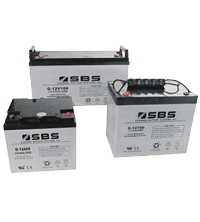 VRLA batteries are considered "maintenance free" and require no addition of electrolyte or water. 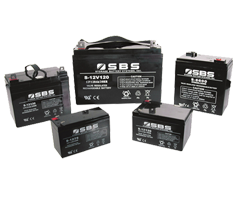 Styles of sealed VRLA batteries include front-access telecom cells as well as high-rate UPS replacement batteries for Liebert, MGE and Powerware among others. General purpose SLAs are also produced for emergency lighting and other applications. Absorbed glass mat (AGM) battery - has the electrolyte absorbed in a fiber-glass mat separator. Gel battery - "gel cell" - has the electrolyte mixed with silica dust to form an immobilized gel. The name "valve regulated" does not wholly describe the technology. These are really "recombinant" batteries, which means that the oxygen evolved at the positive plates will largely recombine with the hydrogen ready to evolve on the negative plates, creating water and preventing water loss. While these batteries are often called sealed lead–acid batteries, they always include a safety pressure relief valve. As opposed to vented (also called flooded) batteries, a VRLA cannot spill its electrolyte if it is inverted. The valve is a safety feature in case the rate of hydrogen evolution becomes dangerously high. In flooded cells, the gases escape before they can recombine, so water must be periodically added. If you have questions regarding which VRLA battery will best serve your application, please contact our Sales/Technical Support department.